It’s a rare fantasy story that really surprises me. Partly, I have read a lot, but often there appears to be a collective dearth of imagination. I know readers — myself included — enjoy and find easy comfort in stories filled with familiar characters and plots, but once upon a time, before fantasy became a mass-market commodity in the 1970s, there seemed to be limitless inspiration in the stories that were told. Contemporary fantasy keeps getting stuck in homage and mimicry. When faux-European settings weren’t the norm, a reader could be transported to worlds as strikingly weird as Hodgson’s sunless Night Land, Burroughs’ dying Barsoom, or the haunted corridors of Peake’s Castle Gormenghast. When there’s no limit to the colors on a fantasy writer’s palette, why do I feel like I keep seeing the same dozen or so? It was exactly three years ago that I first encountered Raphael Ordoñez’s writing. 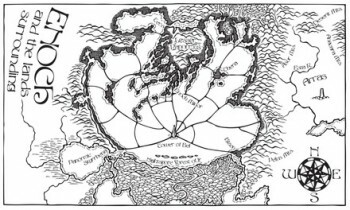 “The Goblin King’s Concubine” (BCS #129), a captivity narrative set in a deadly, spider- and fungus-infested jungle swamp on the dying world of Antellus, was like nothing else I was reading at the time. I sought out Ordoñez’s blog, Cosmic Antipodes, and spent hours reading his older posts on things ranging from planetary adventure to painting to autism. His love for storytelling unconstrained by the modern expectations of genre fantasy were refreshing. By the end I was ensnared, and watched for new stories with anticipation. Each is strange and unique and couched within a complex cosmogony which is a mix of Old Testament, William Blake, and pulp nuttiness, among other things. It can be read about at length here. Last year, Ordoñez self-published the novel Dragonfly (read my review here). It brings together several characters introduced previously in short stories. Unlike the discrete events of those tales, the novel is a full-blown epic. Keftu, sole survivor of a desert tribe, thinks he is the only person alive in the entire world, until he espies a glowing city floating above the ocean. He is prevented from reaching the sky-city Narva when he falls into the clutches of the Cheriopt. The Cheripot is the the “semi-divine headless social machine” that controls everything in the crumbling, ocean-encircling megacity, Enoch. He becomes by turns, a famous gladiator, a liberator, and finally, the last hope to thwart the half-goblin Zilla’s nefarious plans to throw Enoch into total chaos. Now a year later (both out here and inside the book), comes The King of Nightspore’s Crown. As with Dragonfly, the first thing you notice is the beautiful artwork. Ordoñez, an accomplished artist, painted the cover and drew the map and interior illustration. 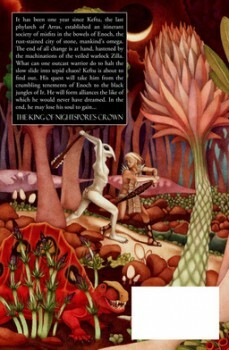 The cover, inspired in part by the Ballantine Adult Fantasy books, is an anomalous thing of originality when viewed alongside the dreadful ranks of brooding, photoshopped characters littering too many other new books. (You can read about the cover’s creation here). Keftu has become the secret leader of a band of refugees out of the cavernous underworld of Enoch. Most of the people know him only as the ex-pit fighter Keftu. By night, though, he puts on his armor and wings and, as the mysterious Dragonfly, leads them forward, negotiating with subterranean tribes and removing monsters from their path. This does not last. Zilla has not forgotten that Keftu exposed and tried to stop him earlier. When a force of ghulim (primitive proto-humans) possessed by spirits attack the refugees and capture his lover, Seila, Keftu decides to confront the half-goblin. The King of Nightspore’s Crown unfolds episodically. Keftu first launches himself against the individual responsible for the ghulim attack. That excursion brings him up directly against Zilla. After failing to stop his enemy, Keftu begins a quest that will take up much of the book: discovering the true origins of Zilla and the sources of his knowledge and power. Written in the first person, we see Antellus and its people through Keftu’s eyes. Raised outside of Enoch and apart from its hordes of phylites (clans), helots, and criminals, he is one of the few people able to see through the shroud of customs and laws which hides the corruption gnawing at everything. 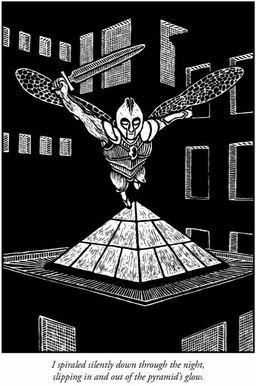 Keftu’s quest takes him from a city of air spirits to the vast Asylum of Enoch, and then to the deadly Nightspore Forest, first visited in “The Goblin King’s Concubine.” Spawn of the titular king and concubine, Zilla’s roots rest under the eaves of the great arboreal region. There Keftu will learn more about his opponent and even more about himself and the forgotten nature of Enoch and Antellus. The journey through Nightspore is filled with monster fights, a great crusade against Geirod the Goblin King, raging battles, and strange revelations that lay the groundwork for a final confrontation around the great tower that supports the glowing aerial city, Narva. 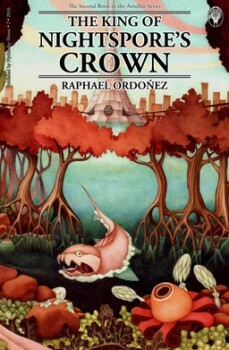 No simple description of The King of Nightspore’s Crown’s plot will give more than a hint of the richness of this marvelously idiosyncratic novel. It’s written in vivid language, is filled with real and invented beasts, and makes several appreciative nods to classic fantasy texts (e.g. 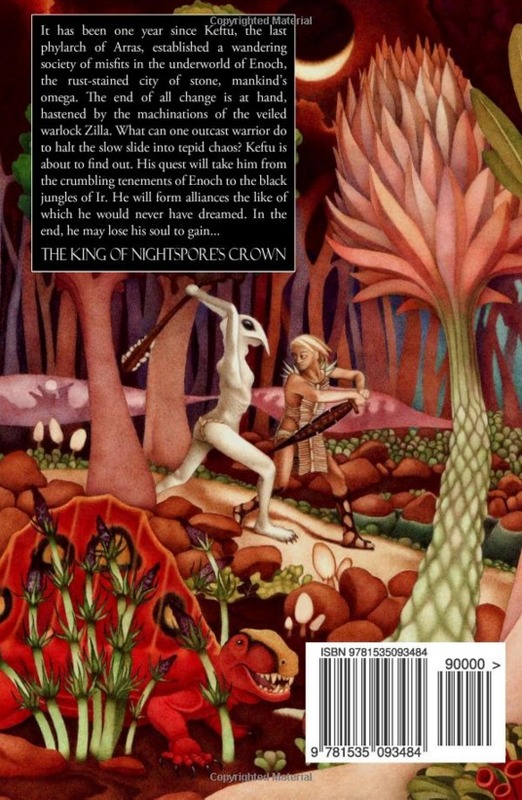 Nightspore is a character from A Voyage to Arcturus and there’s a chapter title lifted from The Lord of the Rings). Keftu and the other major characters thrum with vitality. Even the slightest characters seem to have seeped from Ordoñez’s pen fully clothed in flesh and blood. The whole book feels alive. The dark tunnels undermining Enoch, the rotting apartment towers of the city, and the terrible Nightspore Forest all feel alien and full of terrible wonder. The dark channel flowed past sandy banks. The luxuriant undergrowth had given way to huge fungus, pale orange or white or blue-green, some wrinkled or spotted, others clothed with white hair like little old men without faces. Cockroaches crept slowly over the decaying fruiting bodies, white and wingless, preyed upon by fleet-footed spiders patterned in gray and dusty black, whose tufted legs, touched with metallic blue-green, terminated in pale pink tarsi. At the bends in the river, where the banks were higher than elsewhere, great muddy burrows gaped like open mouths. “Elmoth holes,” said Cyrus. “You can’t see them, but they’re in there all right, watching us.” He kept the boat well away from them. the “more cowbell” school, you might call it (to allude to another classic). Some people will try to tell you that less is more, but “more cowbell” people insist that only more is more: more miracles, more fireballs, more talking squids in space. This tale of Keftu, second in a planned four-volume series, is definitely part of the “more cowbell” school. Every chapter introduces something new — monsters, haunted locales, heroes, and villains. Ancient champions appear out of the mists. Mad plots abound inside of madder ones. The history of Enoch grows deeper and darker page by page. Then there are the organic battle suits grown from tiny ova with the power of men’s minds. I set the monstrance on a ledge, removed one of the ova, and laid it on a stone before me. It was linked to me now. I could feel it. I closed my bodily eyes and opened the eye of my mind, meditating lightly, ignoring the noises I heard. A thing of terror and beauty took shape before me, argus-eyed, many-winged, standing on three wheels of cilia shimmering in curved wells. Still meditating, I took up the monstrance and climbed to my place, alive only to my vehicle’s sensations. I reached out with folded tarsi and wrenched the rust-eaten bars asunder, then rolled forward through the water. The book never lets up. Keftu is in almost constant motion, shuttling from one clue to another, one land to another. Ordoñez expects the reader to hang on for the ride, rarely unveiling the full truth. The book, like life, abounds in unanswered mysteries. At the same time, it never feels like the author’s just making it up as he goes along. Instead, he has a sure and steady hand on his creation and knows just where he’s taking Keftu; and us. But my first and only real love is the pre-Tolkien canon. How many times have I read A Voyage to Arcturus or Phantastes or The Worm Ouroboros? Too many to count. If I read modern fantasy, it’s because I’m looking for something to satisfy the hunger whetted by these works. But, more often than not, genre fiction cheats this desire. It’s got no bite, no danger, no weirdness. It’s tame. To put it in galline terms, it’s caponized and clipped. It lacks the grotesque stylistic bosses, the glowing digressions, the awkward framing devices and dumb shows of the classics. I could point to myriad ways in which the works of the pre-Tolkien canon influenced one another. But each draws far more from philosophy and science and mythology. They were part of a real literary movement rather than a genre. A literary movement is a living thing that grows according to its own inner logic and is necessarily bound in time; a genre is a dead thing, a pigeonhole in a commercial classification system depending on the presence or absence of various material elements. The difference between fantastic literature and a lot of genre fiction is the difference between a Gothic cathedral and a McMansion. As I wrote earlier, I find this attitude refreshing. For all the truly good new stories I read these days, I find another dozen that only echo each other, having no deeper roots and resonance than other genre books of the past decade or two. 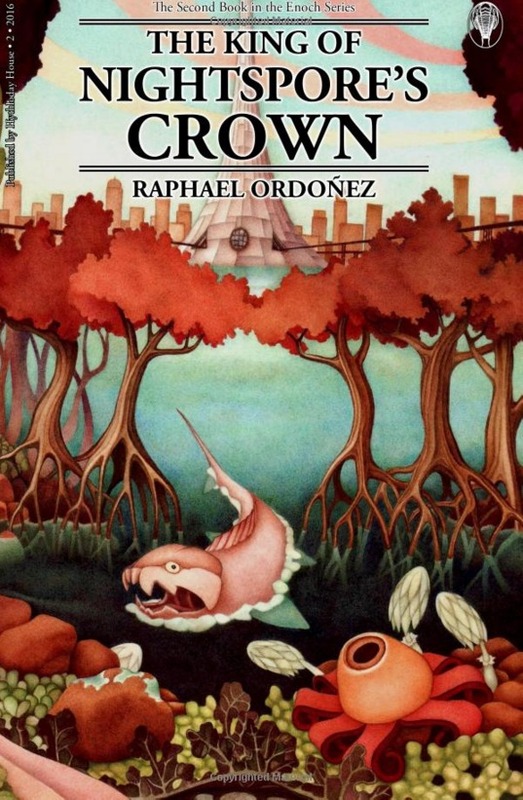 Whatever else about The King of Nightspore’s Crown, in it, Ordoñez is clearly creating something different. There are two caveats I have about The King of Nightspore’s Crown. First, even with the very useful section titled “What Has Gone Before,” reading this book without having first read Dragonfly is not recommended. Secondly, there is no glossary in a book that is filled with real and imaginary names for all sorts of prehistoric plants and animals. Greek and Old Testament words litter the pages as well. Much of the book’s mood comes from the language, but at times it may seem to be a bit of a slog. All of Ordoñez’s writing I’ve read is like this, but you should definitely not let it deter you from experiencing its richness. This is a book that anybody with a love and appreciation for fantasy should experience. Unfortunately for the technologically inclined, The King of Nightspore’s Crown is presently only available in print form. The next volume is titled The Ark of the Hexaemeron. Fletcher Vredenburgh reviews here at Black Gate most Tuesday mornings and at his own site, Swords & Sorcery: A Blog when his muse hits him. I was wondering when I’d see a post about this book! I’m in the middle of reading it right now. Ordoñez is rapidly becoming one of my favorite current authors; Dragonfly was high on my list of books last year, and I gifted copies to a few people. Definitely on my list now – and that cover reminds me of something from the old Ballantine Adult Fantasy series. @ Black Hood – It’s awesome to hear that you enjoyed Dragonfly that much. I hope Nightspore is equally to your liking. I distinctly remember the Dragonfly review here at BG because the cover was such a nostalgic throwback. When I first saw it I thought, “Hey, I thought I had all of those Ballantine adult fantasy books!” This new book’s cover is awesome as well. Thanks for reviewing this. I definitely want to get my hands on this author now. After reading one of them, I quickly sought out all his other shorts in the magazine. Both his novels are on my to-buy list.